The way I see it the stage world just looks better when you have more options toward supporting or flying scenery. At Willow Creek Church, suspending scenery is very common. At times, we may create over 100- 32’x 1/16” cable drops to suspend a certain weekend look that weighs a few thousand pounds. Even though it’s a lot of detailed work with the risk involved, I’m comfortable at the frequency of the process. Creating cable ends with aircraft cable doesn’t have to be scary stuff. It can be quick and reliable when properly using the correct techniques, crimping tool and hardware. Let’s unpack some information and quickly eliminate some of your fears. There are many great crimping tools on the market including the hand swage tools, cordless and hydraulic. One of my favorite crimping tools for under $300 is the bench model crimper. Http://www.stageriggingonline.com/hsbemoswto.html. I’ve used this model for several years, and it consistently produces a great crimp every time. It is reasonably priced, convenient and reliable making it the best choice toward a crimping tool in my opinion. For cutting aircraft cable, you will need cutters that are designed for cutting this type of cable. Www.stageriggingonline.com/tools—fittings-cutting-tools.html. There are many to choose from small to large. 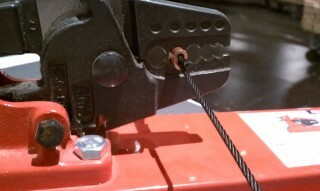 I use the smaller cable cutters for most of the 1/16” and 1/8” cables and the larger cable cutters for any size bigger. It’s best not to use a grinder to cut the cable because of the heat that is generated by grinding the cable will distort the metal properties in the cable that could cause failure. Now with all that said, I think we all have met the guy who isn’t prepared to waste his hard earned dollars on the right tools, getting by with using a bench vice, pliers, hammer or teeth.  Let me say this with your best interest in mind, those methods may cost nearly nothing but guarantees failure when the cable is pushed to the limits. 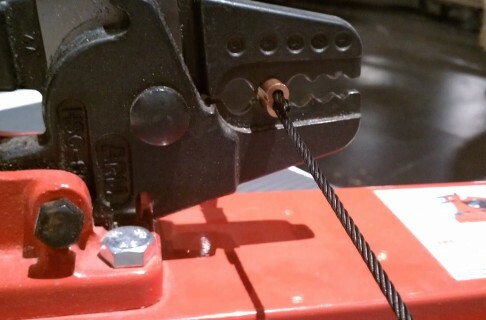 Always use the correct crimping and cutting tools for your cable and swages. There are three styles of swages, also called sleeves or ferrules, in common use; round swages are used for cable end stops; oval and double barrel swages are used to make a cable end loop. Www.stageriggingonline.com/slandst.html. The double barrel is my favorite and most used swage. It keeps the cables in their proper places while crimping. All three swages are available in a variety of cable sizes and materials such as aluminum, copper, zinc plated and stainless steel. There has been many a discussion on which swage holds better under a shock load, copper swages or aluminum swages. From my experience and research the copper swages are shown to hold up better under a shock load, but both are equal under load weight. Depending on the applications aluminum and copper are used the most for indoor applications and zinc coated and stainless steel are used for outdoor use. Bear in mind, using two dissimilar metals or the wrong kind of swage material for outdoor use can set up a corrosive reaction resulting in failure in a short period of time. Remember corrosion can also happen by wrapping tape around the swage and cable. Tape is a no no.. Remember, always be aware of your responsibility toward creating a safe environment and improving upon those rigging skills. In the next article, we will discuss thimbles and crimping techniques.